Shafaroodi, H., Zareie, H., Asgarpanah, J. (2014). Anticonvulsant activity of Astragalus squarrosus Bunge. Research Journal of Pharmacognosy, 1(2), 45-49. H. Shafaroodi; H.R. Zareie; J. Asgarpanah. "Anticonvulsant activity of Astragalus squarrosus Bunge". 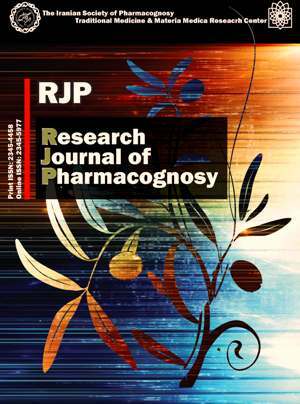 Research Journal of Pharmacognosy, 1, 2, 2014, 45-49. Shafaroodi, H., Zareie, H., Asgarpanah, J. (2014). 'Anticonvulsant activity of Astragalus squarrosus Bunge', Research Journal of Pharmacognosy, 1(2), pp. 45-49. Shafaroodi, H., Zareie, H., Asgarpanah, J. Anticonvulsant activity of Astragalus squarrosus Bunge. Research Journal of Pharmacognosy, 2014; 1(2): 45-49. Pharmaceutical Sciences Branch and Pharmaceutical Sciences Research Center, Islamic Azad University, Tehran, Iran. The anticonvulsant activity of Astragalus squarrosus total extract was assessed in pentylenetetrazole (PTZ)-induced convulsion in mice, with diazepam as the standard drug, while mechanistic studies were also conducted using flumazenil, a GABA A-benzodiazepine receptor complex site antagonist. The extract produced protection against convulsion at 400 mg/kg, comparable with protection of benzodiazepine (diazepam). The mean onset and percentage protection against convulsion in extract-treated mice were reduced by flumazenil. The results suggest that A. squarrosus extract possesses biologically active constituent(s) that have anticonvulsant activity which supports the ethnomedical claims of its use in the management of seizure.